My AT&T Moto X (running KitKat 4.4) is very finicky about displaying photos received via MMS. I often see a gray image placeholder instead of the picture itself. I have figured out two workarounds, and they depend on whether the MMS was sent from another Android phone or an iPhone. The workarounds involve saving the images to the sdcard and viewing them outside of the Messaging app. 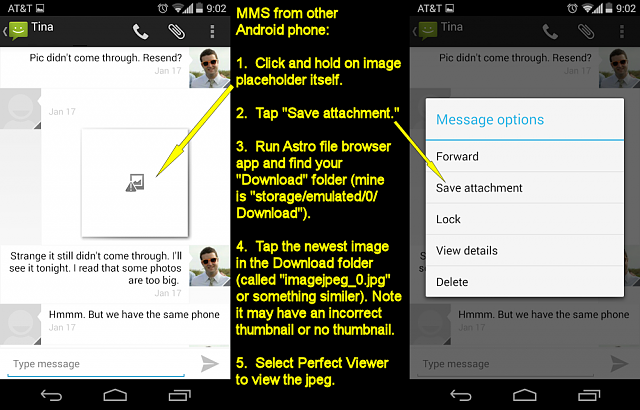 Here is a graphic showing the workaround for MMS pictures received from other Android phones (in this case, another Moto X on Verizon). Note the look of the image placeholder--it's an image with an exclamation point triangle in front. To save the image, you tap and hold directly on the image placeholder. Once saved, use Perfect Viewer to view the image. Android and most image viewers think that the image is corrupt, which is why you need to use PV to view it. 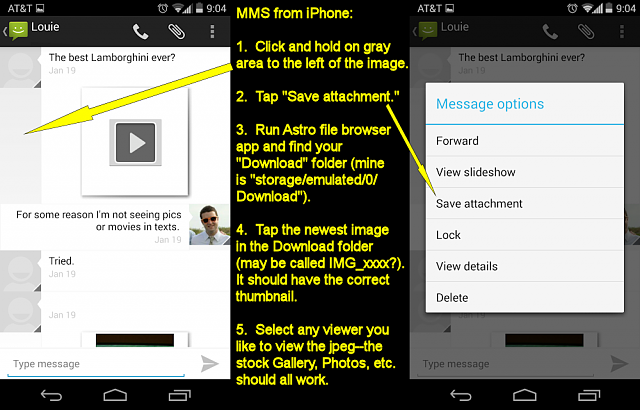 And here is a graphic showing the workaround for MMS pictures received from iPhones (in this case an iPhone 5 on AT&T). Note the look of the image placeholder--it's a play button. To save the image, you tap and hold on the gray area to the left of the image. These images, once saved, are not treated as corrupt so you can use any image viewer to view them. EDIT: I realize that clicking on the play button actually launches the text and image as a slideshow, so I guess this should just be considered a "how-to" for saving the jpeg. Let me know if these work for you guys! Thats way too much work to view pics ina text message. use a different sms app like go or textra and you wont have any problems. I switched to Hangouts for texting and everything just works now. I was having the same issue as you with the native app. Don't yet see a downside to using Hangouts. I used Hangouts for a couple months but recently switched back to the Messaging app. My problem was that I could not seem to get Hangouts to default to SMS for all messages. If I happened to choose a contact that has a G+ presence it did not want to easily let me change to SMS. I disabled Hangouts because I don't want to mix text messages with Gmail chat, or to be signed in to Gmail chat all of the time. Basically, I hate Hangouts. I'm not sure how it all works together. I have a gmail and google plus account. Don't really use plus. I've been using Hangouts as my text app for a week and it doesn't seem to work or look any different than any other text app to me. I'm coming from iPhone though and I'm not a power user of Google stuff. For me it just works so far. I use Hangouts for the opposite reason. I still have an unlimited data plan with VZW and I only have 500 texts per month to non VZW phones. So any friends that aren't on VZW I use Hangouts with, and use SMS with anyone on VZW. I like having it all in one place. does this mean if you use hangouts as your default sms app, that you would be using data when not connected to wifi? any way to use it solely for sms and not gchat? It has a little SMS on the picture of the person to the left of a message that says it is an SMS and not a hangouts message. I'm sure you can sign out of Hangouts(Gchat) if you want and still use it for SMS only. SMS doesn't use data. I use Hangouts and still have the issue, plus a couple of different ones. Every so often (like today), an iPhone user sends me a pick that just shows up as a black box. I try to open it, but Photos opens and says "Couldn't load image". Other times, people will send multiple pics in a single message and when you try to view them full-screen, it briefly displays the pic you selected, but then brings you back to the first one, with no ability to move forward or backward between pics in the viewer. Just tapping on the grey area also brings up the options box..didn't need to download any other apps. Chose 'Save attachment' and it went automatically into my downloaded folder in my Gallery. Awesome!! Using Droid Ultra on VZW. Thanks for the great workaround and images-what a lifesaver! That's partly my issue with hangouts as well. You just can't send multiple pictures in a single message. Even with the stock messaging app you can do this. Just doesn't make any sense ..anyone else experience this issue at all? I have the unlocked Verizon model of the Moto X. My Android version is 4.4.4, I use handouts for SMS/MMS, and I have not experienced this issue. I'm glad I am not having this issue because that is a whole lot of trouble to view a message with a picture attached. However, I think we all should appreciate you posting this work around for those that do have trouble. There are too many people that just come on here to criticize. FANTASTIC!!! YOU ARE A GENIUS!!! DID I SAY THANK YOU AND HUGS AND KISSES??? My issue was with opening a friends IPhone photos/videos on my android. Thanks again! These thanks go to the individual who said download 2 apps: Astro & Perfect with detailed instructions. This totally worked on my Samsung Galaxy S3! You're a life saver! Thanks! Thank you for the information that I could not find anywhere else! I have a Moto X (original) and could not figure out how to save images texted to me from iphones. I followed your instructions and it worked perfectly, first try. Now I can save cute pictures of my grandson that my kids text to me! Have anyone find out what causes this problem. I have a Nexus and it cannot receive screenshot mms from Samsung. I still dont know what causes the problem, only able to pin point it down a little closer. This work-around does work but it would be nice to actually solve the problem. Bluetooth turning off and not being able to turn back on. Cannot Send Pictures. Need MMS Help! !